Is that guy on the cover Mark Hamill? All told, as covers go I guess it’s not bad. 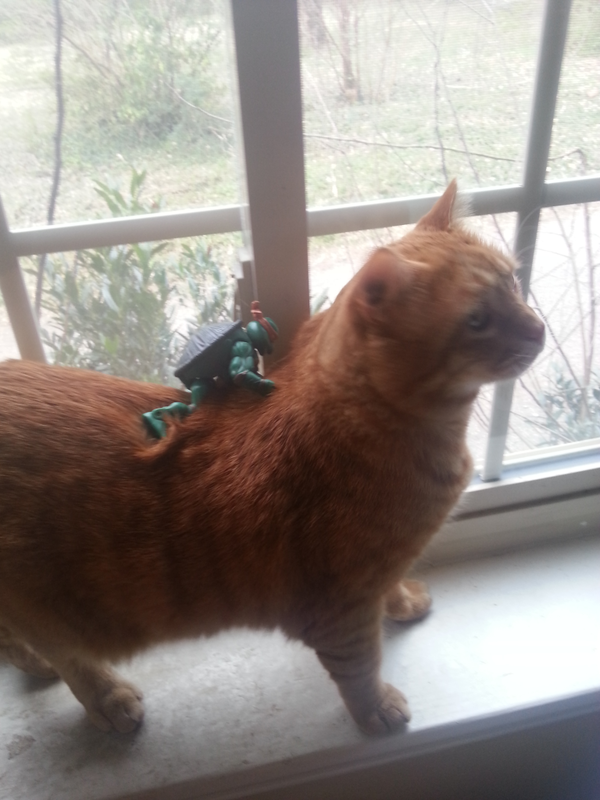 I mean, that guy is riding a giant cat on some sand. It sets things up. The guy looks pretty serious about something. I guess he lives in a desert and has to ride a giant cat to get anywhere, two things that would make most people pretty serious. I can think of worse ways to go about one’s life, but not many. What’s the deal with calling a series of books a “cycle,” anyway? Unless the last book ends with the guy going back to the beginning and starting over, it doesn’t strike me as especially cyclical. The only sci-fi/fantasy series I’ve read that I would actually call a cycle is Stephen King’s The Gunslinger. Spoiler alert, by the way. And even that’s not a perfect description. I think I’d call that more of a literary equivalent of a roguelike game where we only get to see one playthrough. I guess I’m not qualified to state whether the Gandalara Cycle is a cycle, since this is the first of three books and gods only know if I’ll ever find the other two. At the moment I can’t say I’m all that interested in doing so. The book was okay, I guess, but it’s another one of those books that are ever so hard to write about: just a book. It had some neat things going on and it had altogether too much exposition to tie those things together. It wasn’t highly original, but it was written clearly and all those other things I’ve said about dozens of other books I’ve reviewed that fall into the category of take-it-or-leave-it. One of the things this book does that I’ve never liked is the “start the book with a one-page cryptic conversation between two unseen characters” thing. I don’t know how else to describe it, but you’ve probably seen it somewhere. In some books we meet those characters and figure out what they’re talking about, but not so in this one. All we get is that some guy is the “Recorder” and he has a difficult task at hand, presumably recording the events of this novel. Some of the terms like “Recorder” and “All-Mind” come up in the text, but we never learn just what these folks are up to. They show up again for the epilogue to rehash what they said at the start of the book and establish that the Recorder is going to take a quick break before coming back for the sequels. Our hero, Ricardo Carillo, wakes up in a desert. He thinks he’s dead and has gone to hell. He has good reason to think the first part. Last thing he knew, he was getting ready to die of a combination of ailments when out of nowhere he and the cruise ship he was on get hit by a fireball. We never learn what’s up with that, but now he’s lying parched in a desert next to a dead body and he doesn’t know what’s going on. Not a bad setup, really. The “waking up on a weird planet” angle isn’t especially new but the dead body makes it more interesting. Making it even more interesting is the fact that Ricardo then discovers a gigantic cat. At first he thinks the cat is going to kill him, but then it turns out that they’re pals. Some memories start to come back to him and he learns that he’s supposed to be a dude named Markasset. These memories are clear enough to get him where he needs to go, but not so clear as to deprive us of a sense of mystery until the end of the book. Ricardo/Markasset and the giant cat, Keeshah, head home. Ricardo finds his hometown and fumbles his way through interactions with people. The memories transferred from whoever’s body he’s inhabiting seem to be hit-or-miss most of the time. There doesn’t seem to be much consistency, it’s just whatever the plot demands. Some chick is all “What are you doing home so early don’t you know the cops are after you and also the guy you owe money oh hey I have to go bye” so that Ricardo (and we) can go “WHAT” for a while and then we go home and get lots of exposition. Markasset’s dad, Thanasset, is in some trouble. His job is to guard some kind of fabulous jewel, the Ra’ira, and it seems he fell down on the job. Lots of people suspect that Thanasset was the one that actually stole it, probably in league with Markasset, but there’s no proof. Still, things are rough. At the very least Thanasset was negligent in his duties (he distinctly remembers locking that door, though). The exposition, something like forty pages of it, kicks off now. Thanasset quickly realizes that Ricardo is not the son he knew. It seems that Markasset was a selfish prick most of the time. He had the aforementioned gambling debts, he’s been stringing along that girl we met a few minutes ago, and he’s generally disrespectful and cocky. Still, we’re told that at his core he’s a good guy, even if his father doesn’t like him very much. A thing in his favor, though, is that he earned the respect of a sha’um. That’s what Keeshah, the giant cat, is. Keeshah is/was Markasset’s mount and best friend. They’re psychically connected and can communicate wordlessly. Earning a sha’um is a difficult thing that only a few people are capable of doing. And once all that’s over, Ricardo figures he’ll go find this stone and exonerate both himself and his “father”. Oh, one thing worth mentioning is that Thanasset doesn’t seem to worry about where his son actually is all that much. In fact, the general attitude expressed is comparable to someone who just traded in his car at an amazing value. Not only is his new “son” better mannered and more honorable than his old one, he’s still got the old one’s fighting ability and bond with a giant cat. Hooray. So once all this talking finally ends (we’re more than halfway through the book here, people), Ricardo (who just went along with this “Visitor” thing and never mentioned that he’s from Earth) decides that he’s going to find this pretty rock upon which civilization is based. Before that, there’s a bit of an action scene because it turns out that the head cop in the area, Zaddorn, already didn’t like Markasset and so he’s going to make things difficult for him. Ricardo is being chased for most of the rest of the book. Not that it matters all that much. After all, who needs to hurry when you can stop in every town and have the authors show off how much thought and effort they put into defining the world they’re writing about? You know, parts of this book remind me strongly of The House of Zeor. FINALLY with about forty pages left Ricardo gets an idea of how to find this damn rock. See, he’s discovered via having people talk interminably at him for pages and pages that Markasset, just before the book began, had joined a convoy bound for someplace. He figures that maybe if he finds this convoy he’ll be able to learn something. So his big plan is to find some Sharith. 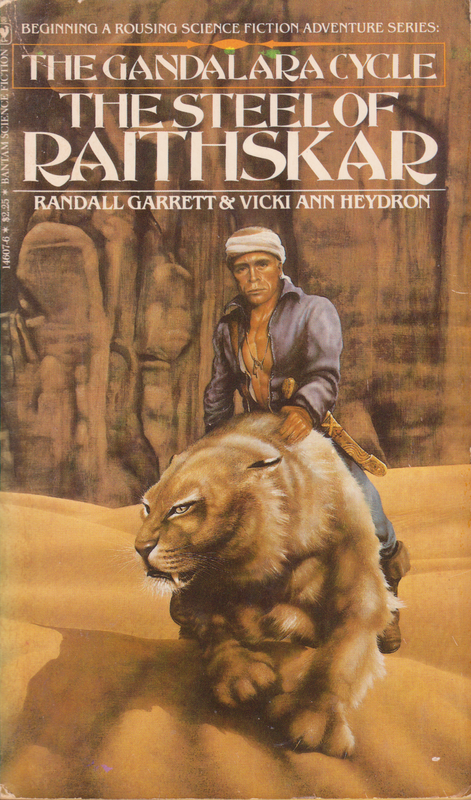 The Sharith are these mercenary guys who also ride giant cats. I think Markasset might have been one? I’m not sure. Whatever the case, Ricardo figures the best way to learn from them is to pretend not to be Markasset at all. He leaves Keeshah behind for a while and wanders around until he finds some, beats them in a swordfight, and then tells them to take him to their leader. Which they do. And then everybody talks for a while. At some point Zaddorn shows up and Ricardo proves how honorable he is by forgiving him and helping him out. The Sharith have one of the members of that convoy under lock and key. It turns out that the leader of said convoy cheated the Sharith out of their money and that won’t stand. We learn some things. The leader of that convoy was named Gharlas. —and Thanasset pulls out this sword and goes “My original son wasn’t worthy of this thing, but you are” and hands it to him. This is about ten pages from the end of the book, guys. We see Markasset meeting Keeshah and it’s all sappy. Then we jump forward to the night the Ra’ira was stolen and Markasset decided to pay off his gambling debts for good by joining up with this caravan and using the money he would earn. We jump forward again to just before the book began and learn what was the deal with that dead body. It turns out that Markasset was following that Gharlas guy, thinking that he’d done something fishy, and then got brained by somebody else. Keeshah killed the guy that brained him. And then we get a cryptic one-page epilogue that gives us no new information. Okay I guess I was a bit more vicious about this book than I intended to be. Honestly, when I was reading it it wasn’t that bad. I didn’t feel the need to stop reading and throw it away or anything. It seems to be only in retrospect that I’m seeing some of the flaws, but even then I think I’m being a bit unfair. I know (or at least feel) that a book where our character sits in a house for half the book while people tell him about the world he’s in makes for a bad book. One begins to think just write a documentary and stop with the pretense of having a story. But it’s easy to see why an author can fall into that trap. It’s an easy way to show the audience what you’ve come up with. What’s more insidious is that if the author did come up with something pretty good, it’s pretty enjoyable to read about it and not get distracted by things like swordfights. At least to me. I’m the kind of guy who likes a lot of backstory and worldbuilding, and if those things are good, I tend to ignore the fact that the author isn’t doling it out in exciting little tidbits and is instead just cramming it into my face like I’m Takeru Kobayashi. And then, after I’m done, I think to myself about how I just sat there and read about a realm where every third word has an apostrophe in it and apparently enjoyed it. But, like Takeru must occasionally do, I end up regretting it, because I haven’t really come away with anything new. Sure, I know a little bit about the world of Gandalara or something, but there’s nothing in there that makes me go “Oh, I guess people do act that way sometimes” or anything like that. I like being entertained as much as the next guy, and this book did actually entertain me, but in the end I really like to walk away having seen something in a new light. That’s why I read science fiction. Are you ready to begin the thing? Then let us begin the thing. …so it gets a little credit.